Stopping Gronk? Good luck with that Pittsburgh | NFL News, as it happens, when it happens. Your one stop shop. The Steelers were ranked 27th in pass defense last season and they plan on improving that this season, and according to two Steelers players they plan on doing that in week one by stopping Rob Gronkowski. Yes they seriously think they are going to stop Rob Gronkowski. 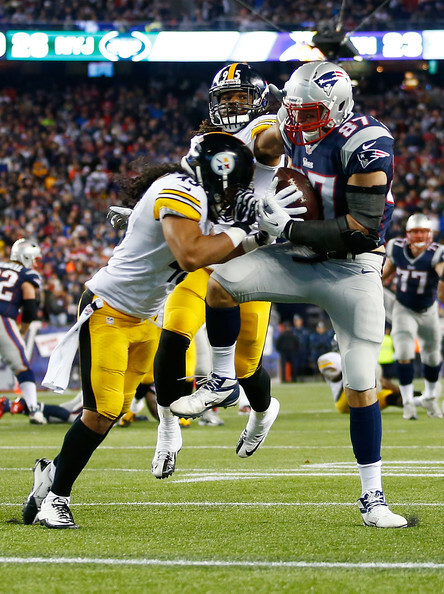 Steelers’ linebacker Ryan Shazier and safety Mike Mitchell said that the Steelers have a game plan to stop Patriots tight end Rob Gronkowski in Thursday’s opening game. The two said that they are going to be physical with Gronkowski and not give him an easy welcoming into the 2015 season. The fact that these two could even say this is just foolish. Gronkowski is the best tight end in the league without question, and when healthy might be the most dominating player in the league at any position. You’re going to be physical with Gronkowski? Gronk is 6’6 and 265 pounds of all muscle while Shazier stands 6’2 229 pounds and Mitchell is 6’ 210 pounds, so if you think you’re going to be able to be physical and stop Gronkowski you can have fun with that because it won’t happen. Gronkowski has played well against every team he’s played against; one team in particular he has dominated against has been the Steelers. 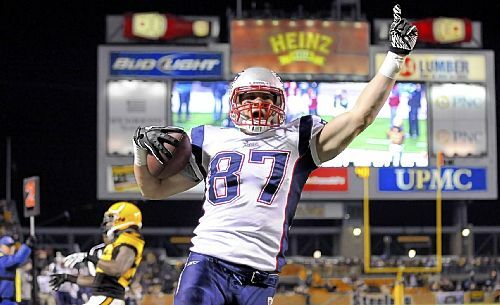 In three games against Pittsburgh, Gronkowski has 309 receiving yards and four receiving touchdowns. Saying you are going to stop Rob Gronkowski is a lot easier said than done. Last season Gronk showed his dominance throughout the whole season by staying healthy and not missing anytime. In 2014 he recorded 82 receptions, 1,124 yards and 12 touchdowns. He is a defensive nightmare for opposing teams with his size, strength, speed, catching ability and his ability to block and be physical. Not many in the league are able to match up against Gronk defensively and he has shown time and time again that he just cannot be stopped. Gronkowski will have a great game against Pittsburgh, like he always does, and will go on to have another fantastic and possibly his best season yet in New England. These guys should think next time before they want to make claims like this and talk before playing against the Patriots. Back in 2007 Steelers safety Anthony Smith guaranteed a victory against the undefeated Patriots. It didn’t work out too well for Smith whose Steelers were badly beaten 34-13, and Smith was embarrassed multiple times during the game by having Brady just constantly throw at him, constantly beating him. Like the Patriots and Tom Brady didn’t have enough fire and anger entering the 2015 season these two are just adding more fuel to the fire. I’m looking to see Brady and Gronk dominate once again and beat the Steelers, and also hope to see Gronk “throw someone out the club” like he did last year to Colts safety Sergio Brown, quite frankly just because its fun to see.